Our range of products include power over ethernet (poe) midspan injector & splitter adaptor and reverse poe injector and splitter adapter. We are engaged in offering our clients a superior quality range of POE Midspan Injector & Splitter Adapter. Withstand Voltage I/P-O/P : 1.5KVAC , I/P-Chassis : 1.5KVAC , O/P-Chassis : 500VDC. 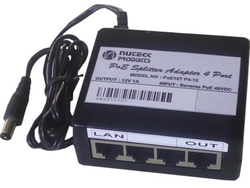 Our customers can avail Reverse POE Injector and Splitter Adapter from us. The offered range of open frame SMPS is made utilizing high grade raw material and innovative techniques in strict compliance with the international quality norms and standards. Looking for POE Adaptor ?